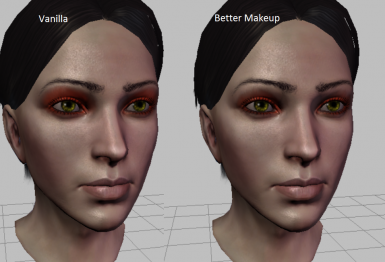 Changes the makeup tint map so eyeshadow doesn't show up on the side of the nose. I personally don't like the look of the vanilla eye makeup. I got the idea to make this after trying to make a female warden and getting hung up on how her eyeshadow looked. This changes it so that the eyeshadow is confined to the eyelids and not the side of the nose. It will work with all makeup-wearing NPCs. To install just drop it in your override. It won't work with another mod that replaces this file if there even is one.